Here we have it, the big reveal! Along with my first post in months and months - and the first post on my new blog platform! Oh yes, and... My first video tutorial! Lots of new things! I've been busy making this super size cream blanket over recent months. It took a while but I got there in the end! Alternate sections of granny stripe and trebles (dc for the US readers) with a front post/back post rib at each end. It's made for a lightweight throw which would work over a bed or as I use it, for snuggling on the sofa or in our van when we are out adventuring! Of course, any of you who know me would recognise the remarkable restraint I have shown in working only in cream yarn for this entire project... Well almost all of it! No sooner had I finished the final row and I was trying to work out how to add just a dash of colour. I had used this smashing pom pom edging technique before with my spring cushion project. I adapted it from this tutorial but for this project I didn't want just a single colour for the border and in order to add just little pops of colour, without the chains and dc/sc's in between, I needed to develop a new way. So I worked out a nifty technique for making little bobble stitch pom poms, straight into any edging, in any colour and with no need to use the same thickness of yarn. The technique hides the first end of the yarn when joining and uses the tail to sew it up into the familiar pom pom shape whilst leaving it hidden in the centre. A very satisfying technique indeed! My blanket was worked with a 10mm hook and aran weight (worsted) yarn but my pom poms are made with double knit and a 4mm hook. As you just join to one single space at a time and there are no stitches in between each pom pom, there is nothing to pull and gather if you work with different yarn weights. 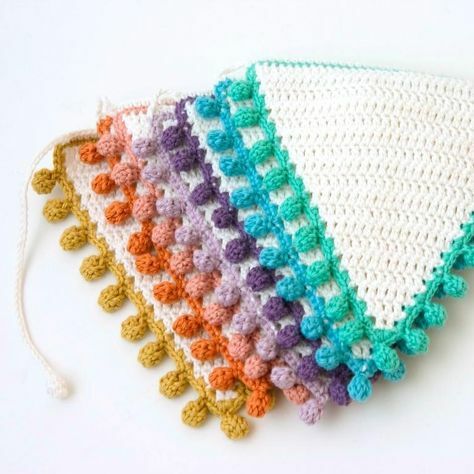 I have written out the pattern for the pom pom's below, but I have made my first tutorial video and I would be stoked if you could find just a few minutes to watch it and comment. If you share this pattern or the video, please credit and link back to me, and if you make anything using the technique, I would be so excited to see photos of your makes! Tag me on social or comment straight onto this page. 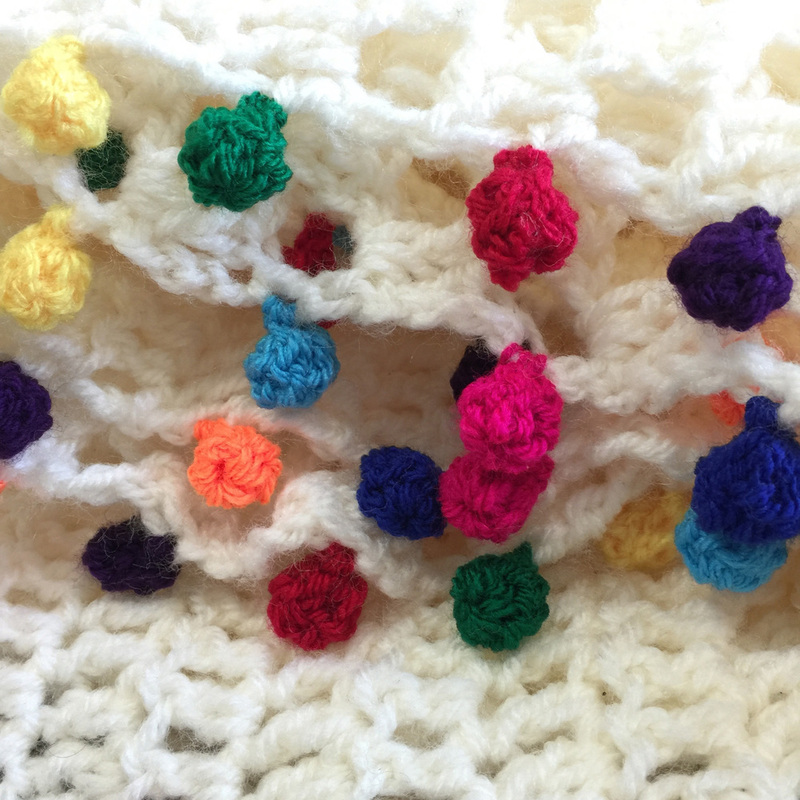 Pull a loop up through the stitch or space you wish to join a pom pom to. No slip knot, just leave a long tail and then continue working with both strands together until tail is hidden. Sl st to join. Ch3, make Bobble Stitch in 3rd ch from hook. ch3, make Bobble Stitch in top loop of previous bobble stitch, ch1, fold down and sl st to join in same place as first sl st. Ch1 to fasten off leaving long tail. To finish, snip any remainder of first short tail to hide. The rest should have been secured when working with the double yarn strands at the start. Thread the long tail onto a yarn needle and stitch up the two sides of the bobble stitches to create a more complete pom pom. Snip yarn close and then pinch and tweak the pom pom into the correct shape. The possibilities are endless... The images below are from my pom pom Pinterest board. You are not limited to merely crocheted projects either... It would be easy to add these to a sewn project, to either tacked stitches, or a crocheted border. That dress hem for example - Divine! So much joy to be found with these little pops of colour! I was asked because of my impending nuptials to write a guest post for the Stitch Craft Create blog. Let me tell you it was quite the cathartic outpouring of stress and I am grateful for the opportunity! I am still slogging away with my various wedding makes and have hardly had time to write or even photograph them. There are a few snaps here and there on instagram and theres a treasure trove of ideas on my pinterest board but I have not been able to blog for ages and I just can't wait now to get married and let normal service resume! Anyway for those of you getting married soon and looking for a bit of inspiration and reassurance that it is ok to do it yourself and have it your own way, head over to the Stitch Craft Create blog now for a few insights into the crazed mind of a soon-to-be-wed crafter! As many of you already know I am tying the knot in August so a lot of my time this year has been devoted to preparing for that. I now have my dress organised, catering booked, music sorted and a whole host of other bits are pulling together nicely but I have not spent much time on the pretty things which will give the event a bit of 'ahhhh' factor. So I have started work on some fabric bunting using scraps of fabric from my stash and my trusty pinking shears! My theme is hessian and lace - but with a colour injection! I am having bright, British Summertime flowers for my bouquet and the table decorations, and will carry the floral brights through to my little flower girl dresses (four floral print dresses of different colours), the cake, and the decor so that there is a colourful and happy theme to the day, without it all getting overly coordinated as that is just not me! These floral triangles will be mixed up with some in rough hessian and others in lacy fabrics to create my bunting. When I worked out what size to make the triangles I did a bit of cutting to see what size of triangle I liked best and what would make the best of the fat quarters and scraps I had hanging around. I ended up with this template and I thought you may find it useful for creating that perfectly sized bunting triangle! Click on the image to get a free download of the template and print it out to use. There is a little twist to this tale. I'm on a shoestring budget for my event and will use every scrap of fabric I can find or recycle. Now I know there are incredibly worthy charities out there, my wedding not being one of them! So if you can put your fabric to better use for them I would much rather you did just that, but if you happen to have any fabric lying around of a floral or lacy variety and you would like to see it appear in my wedding bunting, not having any other use for it, I would love for you to send me an email or comment and I will let you have a postal address to send them to so that I can make them into flags! If you want to cut them to size to save weight and postage that is fine. I appreciate anything you can send. I'm thinking that once it is done and I have used it I could pop a post on showing how it looks. That way if anyone has an event they could use it at down the line I could lend it out perhaps, paying it forward that way?! Just an idea really but there is something lovely about the idea of this happy bunting made from sad little fabric scraps which would never have had a chance at life otherwise! One length of bunting I have been able to complete was made from crochet squares which I made ages ago, intending to cover a chair with them. I got rid of the chair rather than covering it so I had a rhino bucket full of squares! To bring the colourful squares into my theme I crocheted them into a chain of jute twine which I had picked up at Yarndale a few years back. It worked a treat I think and here is the result! This is a small section of it strung out. I love the way the light shines through the colours! I ended up with just over 17 metres of bunting which sounds like a lot but won't amount to much in the face of the walls I need to cover! So time to de-stash the fabric! I don't know about you lot, but for me, February has been absolutely chocca! Amongst other things I've travelled around the country art directing photo shoots for work, designed a trade stand and attended the event to set up and style things, joined the gym, my new craft room furniture arrived and Darren put it together, more on that in another post - so excited to show you! Oh and we might have set our date for the Wedding, finally! We were determined it would be this year we tied the knot even though through various reasons and no small amount of procrastination, we didn't decide on when and where until earlier this month! So now, having set the date - 08.08.15 - we are in a mad panic to get everything sorted. I have been designing my wedding invites this week in between everything else! (Sneak peek here.) Today, we went up to the hall we are using for the wedding after party and measured the spaces, checked what facilities there are etc. We will keep everything crossed for good weather so we can make use of the nice lawn outside. We want to have a hog roast and a bit of a knees-up afterwards and have found a great company who provide a mobile bar and disco! Plans abound so there will no doubt be more of this madness appearing on the blog before the summer. Perfect little venue for our reception! So it was with feelings of love and romance in my heart and wedding bells on my mind that I approached the latest blog hop project with Stitch Craft Create. They showed me an advance copy of this great new book they have coming into stock for March - Hooked! By Michelle, Cécile and Sylvie Delprat. It is available for preorder now and with a free e-bookto get you started while you wait for the print book to arrive! It is full of clever little motif designs and really appeals to the designer and creator in me as the motifs become little building blocks for other ideas or decorations to add as patches to other creations. They can be made with any colours and by using a larger or smaller hook or yarn, the size range is great too. The patterns state quite small hook sizes and I think they are intended to use fine yarn such as sock yarn or cottons. I used my usual Double knit acrylic and a 4mm hook and got almost a coaster sized motif. I reckon with aran weight and a 5/6mm hook they would be big enough to use as such. Of course, with all this talk of weddings and Valentine's day just done, I couldn't resist making the heart motifs in this candy pink. The instructions were succinct and easy to follow and I really liked the way the book was divided so that the 'gallery' of motifs was all together at the front, leaving the instructions at the back to find once the design had been chosen. It keeps the inspiration separate from the instruction and I like that. There are some stitch explanations along with UK/US conversion tables so I think most beginners would be able to tackle this book, possibly with a little help from the masses of youtube videos out there for stitch tutorials etc. If you are the sort of crocheter who likes to create your own look but is not ready to design your own patterns, this book is for you. Even if you are a designer it is such fun it would be hard to resist! The lovely guys at Stitch Craft Create are running a competition to win a copy of Hooked! Along with a crochet goodie bag so get involved! So anyway, back to the invitation designing now, I must get them out in the post otherwise nobody will turn up in August! Back as soon as possible with more on wedding ideas and a craft room update - just wait until you see it! Honestly! If it wasn't for another blog hop whipping me into action I would never post on my blog at the moment! Life has been busy, there has been barely time to pick up a hook let alone write about it but the lovely team at Stitch Craft Create have asked me to join in with their Thrify January blog hop and so 'Boing!' here I go again! I made this riot of crocheted squares last year for months and months. The idea had been to yarn-bomb a chair with them. I even began to attach them to the chair. The only problem was - and it took me a year to admit it - the chair was too big for my craft room. Eventually I came to terms with this and sold the chair. I have different plans now chair-wise so I am left with a huge carrier bag full of colourful crochet, asking to be made into something. After careful consideration I have decided to join them together into a kaleidoscopic blanket for my spare room bed. It will really brighten the room up and I am sure the cat will appreciate a cosy new blanket on what he believes to be his bed! So this week, as a test to see how the colours could blend in sections I created a smaller, cushion version from springtime yellows and blues. We are not quite there yet, the weather today is grey and cold and even the warm browns and golds are disappearing from the hedges leaving bare branches. My choice of colours are a reminder of the splendour to come with daffodils, bluebells and green buds on the branches along with those crisp, blue sky days where the air seems to smell fresher and it feels like everything will be ok. It really felt great joining together those squares, finally using something I had put so much effort into so long ago! I slip stitched them together along the back in rows, then worked down the horizontals. This is absolutely my favourite way to join crochet but I am not keen on the seams it creates showing so for the blanket I will mattress stitch them (which I hate doing but prefer the look of - isn't that always the way?!) for the cushion it worked just fine as the back is hidden inside. I didn't even bother sewing in the ends, just hooked them through to the back and left them hidden. What a massive cheat I hear you say! I assure you had the cushion been destined as a gift or being kept as a permanent fixture I would have taken the time for washability purposes! As I plan on adding these sections into my blanket later on I left that work for another day. To join the two sides together I started with a round of dc going through the stitch spaces. In the next round I put two trebles into every second dc space. And finally - the pompom edging! I have fallen in love with this technique and can't wait to use it for other projects! So if you have a bunch of motifs from a UFO you can't quite bring yourself to grow to blanket proportions, make a cushion! You get that great feeling of success and with half the time! Well that's it. There are a host of thrifty January posts coming along and the list of participating blogs can be found here. Next, it is the turn of Yarn Demon. Happy New Year everyone and enjoy the rest of the hop! I was asked by the lovely folks at Stitch Craft Create to make a Christmas decoration for their Christmas Blog Hop. There have been 25 posts so far in the run up to the festive season. Yesterday we had an insightful book interview by Nicole of Follow the White Bunny with the author of Handmade Scandinavian Christmas, Hege Barnholt. She even made some paper decorations from the book. I think as usual that I got the wrong end of the stick about the theme of the blog hop, judging by all the posts so far. Everyone else seems to have picked a project from a book to make or written a review. There are projects from Handmade Scandinavian Christmas, Washi Tape Christmas and Crochet Christmas Baubles to name a few. It is highly like that I was supposed to follow suit but instead I went off on a tangent and made something new! Whilst pondering the subject for my blog hop I had a day out with a friend and her little girl who spotted a stall with beautifully decorated gingerbread shapes. We took a while to choose our victims from amongst the ranks of gingerbread people and it was almost a shame to devour them, they were so pretty. I got over the feeling soon enough as the gingerbread was delicious! I decided that my decoration would be my own take on this delicacy. Made as he is of crochet, there is little danger of this little guy being eaten by the cat while he hangs on my Christmas tree, which is just as well because he can’t run like his ancestor in the fairytale could! I intend to make him some friends too, decorating them in different ways to create a variety of personalities. See here for US conversion chart. Note: All parts are worked amigurumi style in a continuous spiral. Use a stitch marker to keep track of the end of each round to avoid pickles, swearing and unravelling! Rnd 9: dc2tog around (6dc) FO. Rnd 8: dc in next 5 dc, dc2tog (6dc) FO. Note: FO 1st arm but leave 2nd unfinished. You will continue the body from the top of this leg. Continuing on from 2nd leg. Rnd 1 will join the two legs together. You will dc around the top of each leg, joining together with a ch1 space between them. Rnd 12: dc2tog around (6dc) FO leaving long tail. You could stuff the gingerbread man if preferred and you could add safety eyes to the head before finishing off if you want it as a toy. I wanted mine to look more like a biscuit so I left it unstuffed and added stitching around the edges to keep it flat. Sew in all loose ends not hidden during the stitching of the body. Sew head and body together at neck with long tail on body. Decorate your gingerbread with contrast yarn for ‘icing’ and buttons or beads for ‘jelly sweet buttons’. I gave my gingerbread a heart as well as buttons and used a blanket stitch around the edges as well as some couched stitches to create piping for cuffs and hems of his outfit. You could use any kind of embroidery technique you prefer for this. I would love to see how your gingerbread men turn out. Have fun making your decoration and enjoy the rest of the blog hop. The list of people taking part is here. Next up is the exceedingly talented Lauren of Guthrie andGhani. I can’t wait to read her post! Art Director in Sunny South Devon. My blog is an outlet for my love of craft, in particular crochet, and features reviews, new projects, patterns and a bit of showing off! Watching IT Crowd gold on E4. The one where Roy is 'disabled' 😂 never get tired of this genius!